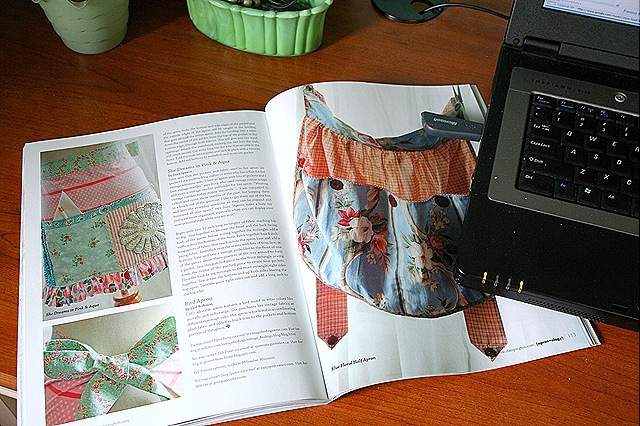 I finally tracked down a copy of the Apronology magazine so I could see how my aprons and their articles turned out. 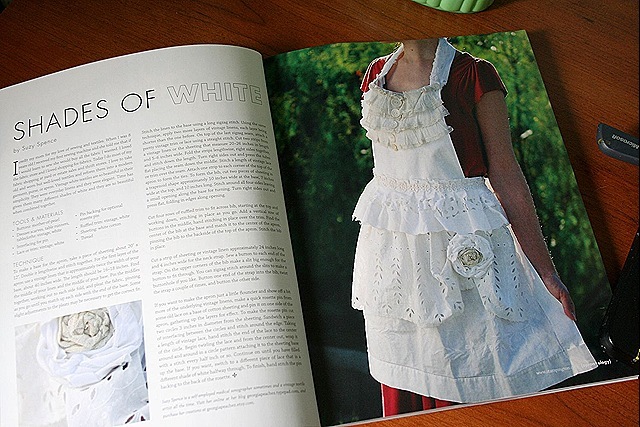 My Shade of White apron is the very first apron in the magazine. See how the model's arm hair is standing straight up in the picture. I think it's because she was so excited to be modeling my apron. don't you? My potholder apron is part of an article about aprons made with vintage fabrics and things. This apron is the one they are using in the ad and I get so tickled when I see it in the other Stampington magazines. So aprons are certainly on my brain lately and you do see them everywhere. But then, aprons have been around forever, right? My mother gave me a wonderful book for Christmas about aprons. It's difficult to summarize the content of this book in one paragraph. 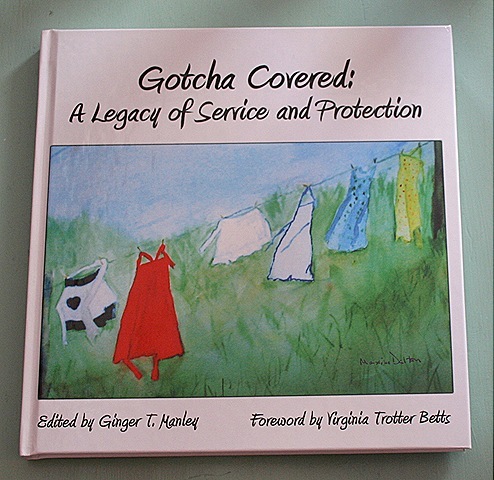 It has to do with vintage aprons, nursing and legacy. Take a moment to go here and see what this book is all about. I never appreciated before how aprons are a long standing symbol of healing, but that they are. Your aprons in this article are so pretty!!! Congrats! No Sightings here in Central Florida just yet,but I have my scouts out! Can’t wait to find it! Clearly she was giddy about wearing the apron,who would’nt be! Love your aprons – especially the white one. I must find this magazine. I have to confess, though, I have never heard of it. I think I am missing something as I love aprons – such fond memories of growing up in the day when aprons were a part of daily life. Your featured aprons look amazing. You must be so satisfied! Congratulations! Hi Suzy, I was just looking for this in Borders and Barnes and Noble this weekend with no luck..do you know if I can purchase on line? The book from your Mom looks interesting. I am genuinely excited to read this article about your work. Just found you thru Charlotte Lyons. My arm hair would be standing up too, sweetheart, because that is a BE-YOU-TEE-FUL apron! I am looking for the mag now and congratulations on your article, etcet. I love vintage aprons! I have collected them throughout the years and now have quite a collection. Actually I should be embarrassed by how many aprons I have but somehow I’m not. :o) I recently bought a craft apron from you on Etsy and I have to tell you that it is one of my all time favorites. It was really cute on the computer but when I got it I was so excited to see that it was even better in person. The materials are darling and the hot pad pocket is the best. Thank you so much for this darling, darling apron. I will be back to Etsy soon! Oh WOW your aprons are wonderful and I love the white one! My arm hair would have certainly been standing…LOL!!! Congrats on the articles!!! I will have to pick up a copy!! congrats! I LOVE aprons. My grandma has given me some of hers, and atwo iremember well wearing as I helped her in the kitchen. Now my daughter who is 11, helps me! They are very wise to use your apron in advertising! Congratulations! And FIRST in the magazine? What an honor…. I’m so happy for you. I am watching the weather and praying for you. I’m glad that you have these sunny “aprony” goodies to brighten you days. Thanks for helping bring spring early! I’m wearing an apron now! 🙂 I bought the Apronology magazine last week and love it. I make regular aprons, but now I want to make a random collage type apron. One of my favorite songs is “apron strings” – and this was long before the apron craze. It reminded me of the homey simpler times, but I honestly thought aprons went out of fashion due to the Women’s lib movement. Happy to see they are back. Hi Suzy! Congrats on the sweet white apron appearing front and center in this fine publication! It’ll probably be a while before we see the issue way out here, but I’ll be watching for it! I love all my aprons, and I have quite a collection! My grandmother always wore an apron, either at the mercantile store she and my grandpa owned and ran, or at home….making German chocolate cakes for us kids! I am just so doggone proud for you!!! Hey…did you know I got one of your purses for Christmas. After posting about your purses on my blog, my daughter purchased one for me as a gift. I had no idea!